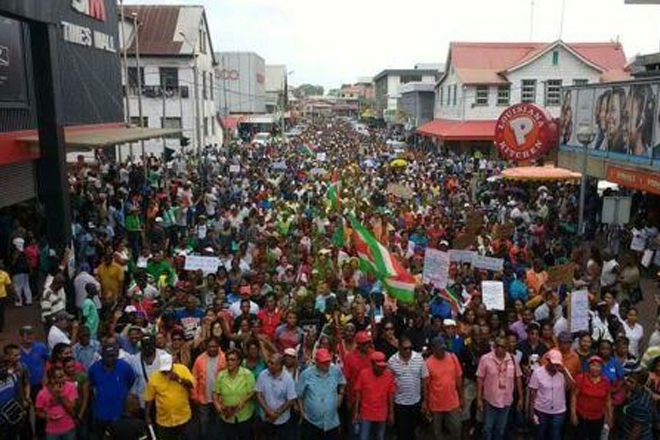 For the second day in a row, several thousand disgruntled citizens marched in the streets of Suriname’s capital Paramaribo on Friday, calling on the Bouterse administration to reverse the recent fuel price hike. Initiated by 30-year-old Maisha Neus, some 1,500 people held a protest demonstration last Monday at Independence Square opposite the Presidential Palace, denouncing recent measures taken by the government, including price hikes for fuel, water and electricity. Last week, gasoline became US$0.08 more expensive per liter and diesel increased by US$0.03 per liter.